String lights – whether we’re talking about fairy-lights, bistro lights, globe lights, the list goes on – are all but an integral part of any wedding’s décor. Whether you’re going for an outdoor, romantic affair under the starry night’s sky, an intimate backyard ceremony, or even an indoor event, the properly chosen decorative lights can take your special day that extra mile, weaving in the right dose of whimsy and subtle charm to make it completely magical. So which string lights are going to make the special occasion that much more enchanting? Let’s take a look at our top picks. There’s something automatically whimsical and dreamy about globe lights, especially when they come in these perfectly spherical, clear glass orbs sure to add a rustic touch to an outdoor or backyard wedding. A single one of these 100 feet long strings holds 100 individual bulbs spaced 12 inches apart, with thick, durable wiring available in white, green and black to suit your needs. Clocking in at 5 watts each and roughly 4.8 amps, a couple of these strings in a canopy over your backyard or artfully arranged down the branches of trees will create the perfect, subtle glow of soft lighting for a romantic ambience, without requiring too much power or giving off too much heat. Although the bulbs have to be screwed in individually, the effort is worth it, as it allows you to ensure that each glass sphere is secured into place rather than risking winding up with broken ones jostled during shipping or falling off after being put up. UL listed to certify safety, and with a (E12) candelabra socket base, these incandescent bulbs will effortlessly pull off the type of warm, muted lighting to accentuate all the right aspects of your wedding décor. These handy festoons of cheery, cream colored orbs are as convenient as they are perfect for adding some extra panache to your wedding décor. 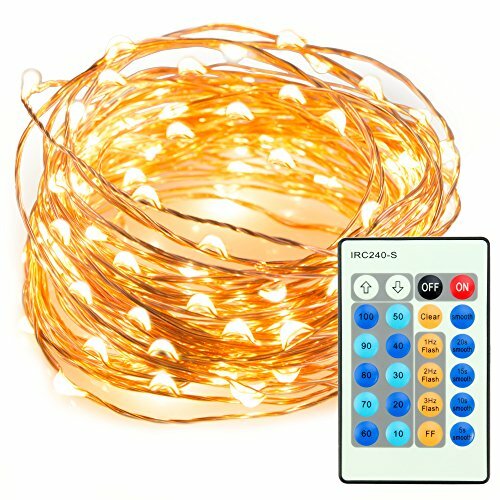 With strings of 37.7 feet bearing 100 globes, these fairy lights come with connectors that let you link up individual strings to extend them over the area you wish to decorate with perfect ease. Perhaps best of all, the power adapter comes with an option that lets you switch between 8 lighting modes, so you can set the mood from bright and energetic to tastefully understated at the simple push of a button. Requiring about 110 volts to light up and immediately spread a festive mood with their warm, gold glow, these lights don’t consume too much power or heat up excessively. The lights can be safely used indoors as well, equipped with a 4-feet lead cable and a DC 31V (low voltage) transformer to plug in. A cascade of streaming fairy lights is a failproof, timelessly classic décor option, and with these yellow icicle wall lights, you can transform any indoor or outdoor space into a classy wedding reception venue. Each of the precise, water- and temperature-proof LED beads are a creamy-white color which light up into charming raindrops of gold to transform any location into a festive one. Available in 8 output modes, you can choose which type of lighting best suits the atmosphere you’re going for, including options for Twinkle/Flash, Slow Fade, In Waves and Steady On. Safety is ensured with a UL transformer plug, the lights themselves requiring 110 volts to operate. Each curtain bears 300 high-performance LED beads on transparent white wires that’ll blend seamlessly into the background, creating the effect of golden lights sprinkling down the walls or from frames. The bendable copper wires of these string lights let you mold them however you wish – around pillars, tree-trunks, or accentuating any other decorative elements you want to add a little extra oomph to. Each 33-feet string is decked with dew-drops of 100 LED bulbs, which light up to a warm white-gold hue. The fine cables connecting the lights give these string lights a dainty appeal, insulated to make them safe to touch even immediately after use. The string comes with a 24-key remote that lets you dim the lights, allowing you to select how intimate or bright you wish the ambience to be, with modes that let you switch around among ‘strobe’, ‘flash’ and ‘smooth’ options depending on the mood you’re trying to set. A 5-feet adapter cable lets you discreetly tuck the low-power adapter out of sight, with both UL and FCC certifications to ensure they can be safely used indoors. Be it a garden wedding or an indoor ceremony, lighting is a critical consideration when it comes to wedding planning. Setting the right mood is dependent very much on choosing the appropriate lighting options, whether you’re going for a rustic effect with glass bulbs in a wide open space or streams of white-gold beads illuminating the venue. As with all lighting, though, it’s important to look at the power consumption. You wouldn’t want to come out of your wedding footing an enormous electricity bill – especially when many great options come with inexpensive power consumption levels. 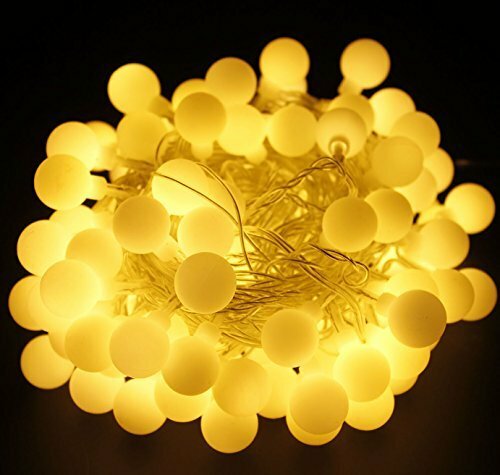 Most low-consumption string lights require about 100-110 volts to operate, low voltages also ensuring the bulbs don’t grow too warm or generate too much heat. Safety is another concern – it’s crucial to pick string lights with low-voltage transformer plugs and UL certifications, insulated cables that don’t heat up over the period of use, and long enough adapter wires to let you hook them up safely both indoors and outdoors. If you’re looking to decorate bigger spaces or using multiple strings of lights, in-built safety mechanisms are vital to prevent any unfortunate accidents or safety hazards occurring. 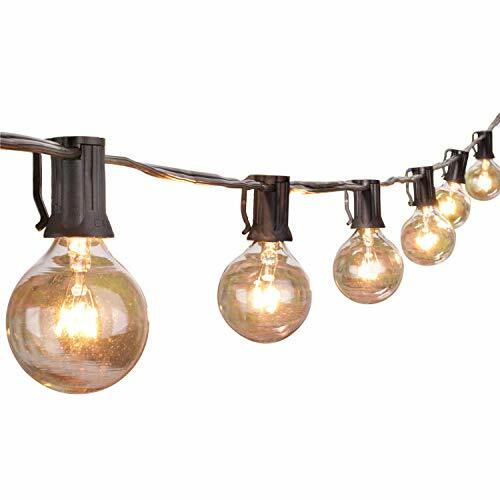 When it comes to convenience, linkable string lights can make it easier to connect multiple strings across wider areas, especially if you’re creating canopies of bistro or fairy lights. Contrarily, if you’d prefer continuous, naturally long streams of lights, opting for strings of intrinsically long cables works too, with great options available at lengths between 50 and 100 feet. 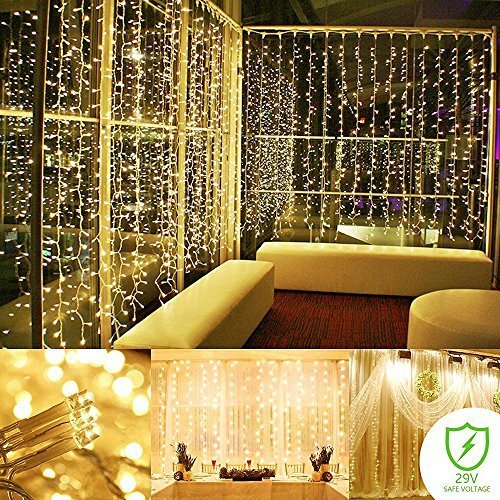 Since ambience is one of the main goals of using string lights, we also recommend options which allow you to accommodate multiple modes, for instance ‘strobe’ or ‘flash’ modes to set a jubilant, festive mood while steady or alternately twinkling streamers create a subtler, more romantic effect. Lights which allow you to adjust the brightness also helps set the atmosphere to be just right.